Microwave oscillators are used in a myriad of applications from mobile phones and GPS navigation systems to radios and test equipment. The purpose of the oscillator is to generate a continuous harmonic output with a defined frequency; this can be accomplished a number of ways. A typical oscillator consists of an active device (e.g. 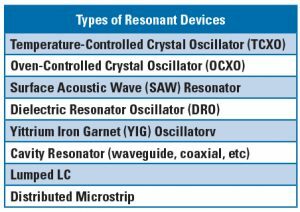 transistor, diode, or microwave tube) and a passive frequency-determining resonant element (see Table 1). In the complex realm of radio frequency oscillators (RFO), solid-state oscillators tend to dominate due to their light weight, small form factor, good performance, and high reliability. Table 2 depicts some of the active devices used in voltage-controlled oscillators (VCOs); two-terminal devices such as Gunn and impact avalanche transit time (IMPATT) diodes exhibit orders of magnitude higher power handling capabilities and tunability. The cost-effectiveness of 3-terminal devices beyond the Ka-band and above a certain power threshold decreases dramatically. The more mature and easily fabricated silicon technologies are not leveraged and complex transistor topologies such as HEMT are more often employed with specialty substrates such as Gallium Nitride (GaN). The cornerstone component of the receiving signal chain — the mixer — ultimately relies upon the oscillator for any frequency translation. More often now, it is found that oscillators that function beyond the Ka-band are useful for the ever-increasing milimeter-wave (mmWave) applications including 5G, WiGig, military and commercial radar, as well as imaging. Gunn diode oscillators can be found in LOs in low noise mmWave receivers due to their excellent AM and FM noise characteristics . The diodes RF output may be directly applied to the mixer’s LO port, or can be frequency multiplied stage for mmWave applications. Transistor-based oscillators are far simpler to produce in volume as pick-and-place machines allow for easier manufacturing capabilities compared to the complex precision milling machines, assembly, and tuning needed with waveguide cavities. Still, a Gunn diode paired with a waveguide cavity offers a simple, cost-effective solution for mmWave prototyping and development where only a few components are needed and manufacturability is not an issue. A Gunn diode does not contain the junction in typical diode topologies, instead it consists of a bulk material that can be characterized by its incremental negative resistance — a property where the current flow through a device decreases when the voltage applied increases. Gunn diodes can therefore be much more simply fabricated with only the need to bias the negative resistance region. Typically, negative resistance is achieved in transistors in a positive feedback configuration. For instance, a colpitts oscillator utilizes this layout in conjunction with a tank circuit or some other resonant device. The drawback to this is at frequency extremes (fmax), the oscillation frequency becomes more dependent on the transistor than the resonating device . The Gunn diode typically consists of N-type Gallium Arsenide (GaAs) or Indium Phosphide (InP) material; both these materials contain two conduction band valleys separated by a small energy difference where the electrons in these valleys have different effective masses. While some materials have electrons and holes with constant effective masses, some do not and behave differently than they would in free space (or a vacuum). This is largely due to their interaction with the other charges in a solid material, including charges from an applied electric field. For GaAs and InP, the additional conduction band, or sub-band, is what differentiates these materials from most semiconductors and what allows for the property of negative resistance. When an electric field, or bias voltage, is applied, the low energy conduction band fills up with electrons of a lower effective mass. The field strength then reaches a threshold at which the upper band fills up with electrons of a high effective mass. The higher mass electrons in the sub-band decrease the drift velocity — a parameter proportional to current density. The drift velocity and current density decrease as the electric field increases, thereby generating a quality of negative resistance. In essence, the difference in the electron velocities leads to bunching of electrons in certain areas (region of accumulation) and a scarcity of electrons in other areas (depletion region) along the length of the device. The difference in potentials within the device set up an internal electric field that opposes the external until it reaches a certain threshold and collapses. The process begins again as long as the external bias is still applied leading to an oscillation. Phase noise, turn-on voltage, and temperature performance are all key parameters in Gunn diodes implemented as oscillators. Oscillators used in 77 GHz automotive applications, for instance, are required to function in a very broad range of ambient temperatures from -40° to +85°C . Furthermore, radar applications such as frequency-modulated continuous-wave (FMCW) radar require not only temperature and frequency stability of the oscillator, but also predictable voltage tuning across temperature to maintain integrity of the radar range resolution . InP Gunn diodes typically offer higher powers into the mmWave band due to the substrate material’s innately high electron mobility, and when paired with a waveguide cavity, the oscillator can perform well into the W-band. GaAs-based Gunn diodes will typically operate in the V-band. The injected, or “hot,” electrons have a higher energy than those at equilibrium. This raise in electron energy greatly increases the probability of the hot electrons directly entering the higher energy conduction band, or negative resistance region. Typically, the diode must be biased enough to oscillate; this turn-on voltage naturally leads to a temperature dependency of the oscillation frequency. Hot injection effectively removes this dependency by bypassing the low energy region. There are three main Gunn diode device structures, including flip-chip (C- to W-band), integral heatsink (Ka- to W-band), and low power device (C- to K-band) . Graded-gap hot injection is a technique that can only be used on GaAs integral heatsink topologies. It is also important to note that Gunn diode packaging parasitics are important to assess to adequately design the corresponding waveguide cavity. Gunn diodes can be implemented with a number of resonant devices including microstrip and fin-line, as well as rectangular and circular waveguides. The rectangular waveguide oscillator generally gives the highest continuous wave (CW) powers and best noise characteristics due to the higher Q of the metal waveguide oscillators. While Gunn diode circular waveguides have been realized, rectangular waveguides’ cavities are more widely leveraged in a variety of applications and the loss associated with a rectangular to circular transition for an oscillator is not always feasible or worthwhile. Cavities can generally be defined as enclosures with conducting walls to completely surround the oscillating device. This confines electromagnetic fields and allows for current flow on large surface areas, and since the Q factor is the ratio of the energy within the cavity to the energy dissipated per cycle through the walls of the cavity, metallic waveguides innately exhibit a very high Q (~4000). Gunn diode waveguide oscillators have also been relied upon for decades due to their relatively simple construction and reliable performance. As much as the oscillator’s build is simple, the electromagnetic mechanisms behind it are quite complex. Factors such as power level, effective tuning, phase noise, and frequency stability with respect to temperature can be affected by nonlinear phenomena compromising the integrity of the oscillator. Still, any of the losses associated with these phenomena are somewhat compensated by the negative resistance of the diode generating sustained oscillations, as explained in the last section. The Gunn diode waveguide oscillator is typically designed with the Gunn diode mounted on a cylindrical post that positions the diode correctly centered within the cavity. The cylindrical post is placed on the broad wall of a rectangular waveguide cavity. A biasing choke is mounted with the Gunn diode to prevent bias circuit oscillations or any spurious modes. The waveguide cavity is typically optimized to resonant in the dominant TE11 mode. A short-circuiting plunger, or movable backshort, is fitted on one end of the waveguide that is typically used for output power coupling, or optimum power delivery to the load circuit. More mechanical fine-tuning of the oscillator is accomplished with a cylindrical low-loss dielectric material such as sapphire, or a metallic probe, inserted midway between the diode and the iris. The tuning range increases as the rod diameter increases. In essence, the impedance of the waveguide cavity must match the Gunn diode oscillator over its bandwidth for optimal operation; this is accomplished in a number of ways in a waveguide cavity, namely through the use of the backshort. A more fine-tuned impedance matching can occur with either fitting the waveguide with tuning screw and a metal frame at the output to generate an iris with ideal dimensions for releasing RF energy, or, through the use of step transformers in a reduced-height waveguide configuration . Another reduced-height geometry includes a ridged waveguide cavity topology . The operating frequency is determined by the λg/2 (λg is the waveguide’s wavelength) spacing between the iris and the Gunn diode while the spacing between the shorting-piston and Gunn diode needs to be a multiple of λg/4 for coherent oscillations to occur. An increase in the diameter of the cylindrical bias post mounted to the Gunn diode affects the oscillator’s turn-on performance but decreases the waveguide cavity’s Q factor. Moreover, the depth of insertion of the tuning screw can also negatively impact the Q value, so sometimes the tuning screw is eliminated altogether. The frequency behavior of the resonator is affected by thermal expansion due to impedance mismatches causing distortions in the cavity. Temperature shifts can occur from environmental temperature changes, resistive power dissipation, and thermal radiation. To mitigate these negative effects, materials with low coefficients of thermal expansion (CTE) are utilized in the construction of the waveguide, backshort, and tuning rod. Temperature compensated aluminum and ceramics can increase the frequency stability, bandwidth, and lifetime of a resonator by constraining the expansion of the material that occurs from heat. The Gunn diode waveguide oscillator has been leveraged for decades due to its high power, low noise, small size, and high frequency capability. From bulk material in the Gunn diode to the waveguide cavity, the seemingly simple construction is backed by complex and precisely tuned geometries and materials for optimal performance. Despite the proliferation of the more easily mass produced transistor-based VCOs, Gunn diode waveguide oscillators fit the growing mmWave test and measurement niche. 1. Arora, R. S., and N. V. G. Sarma. “Experimental Investigation of Millimeter Wave Gunn Oscillator Circuits in Circular Waveguides.” International Journal of Infrared and Millimeter Waves, vol. 6, no. 10, 1985, pp. 951–971., doi:10.1007/bf01010674. 2. Lee, Thomas H. Planar Microwave Engineering: a Practical Guide to Theory, Measurement, and Circuits. Cambridge University Press, 2004. 4. Ishii, Thomas Koryu. Components and Devices. Acad. Press, 1995. 5. Poole, Clive, and Izzat Darwazeh. Microwave Active Circuit Analysis and Design. Academic Press, an Imprint of Elsevier, 2016. 6. Rakshit, P. C., et al. “8 GHz Tunable Gunn Oscillator in WR-137 Waveguide.” Defence Science Journal, vol. 33, no. 1, 1983, pp. 1–5., doi:10.14429/dsj.33.6093.